It is Grab Some Nuts Day today and myself and a group of bloggers are getting nutty!! I thought I would do something sweet but then thought of my huge herb potted garden I have on the deck and came up with Herb Roasted Cashews. I have made roasted nuts like this before and love to serve them as part of an appetizer for company. Nothing could be simpler, really. All of us in this family are crazy about nuts. My mother really liked cashews and I find them a classy nut. I was able to find them raw, unroasted and unsalted so that was perfect for what I wanted!! In our grocery store there is a nice selection of nuts and fresh made nut butters. I like to give nuts as gifts also, of course making sure there is no allergies!! 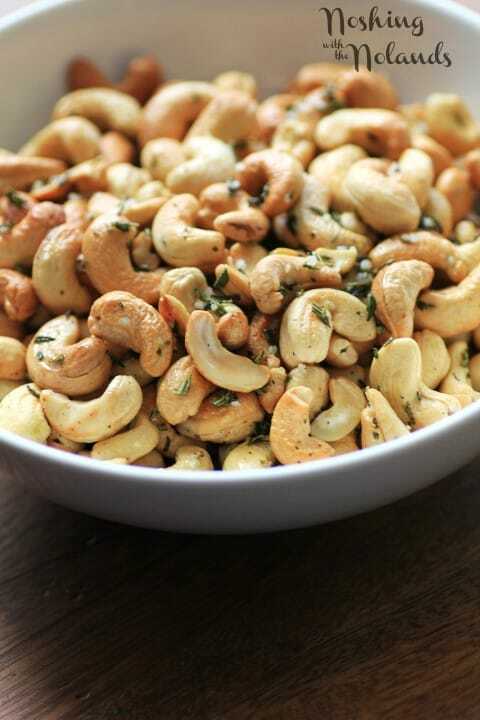 The rosemary and thyme are a perfect combination for cashew nuts. Coating them with good quality olive oil and a small amount of Kosher salt adds to the over all enjoyment of snacking on these delightful nuts. 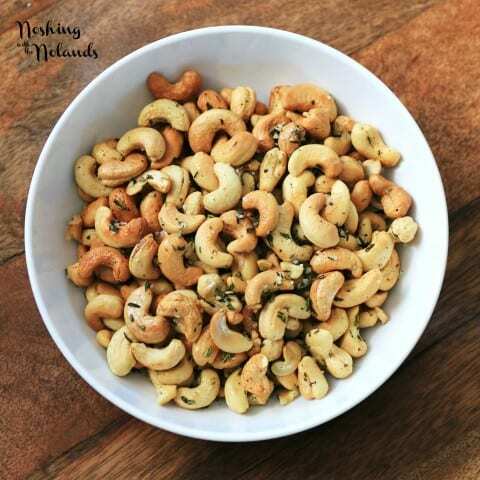 A simple and delicious Herb Roasted Cashew that can be served as a snack or appetizer!! Mix all the ingredients together in a bowl. Toss well and spread onto a rimmed baking sheet. Bake at 375F for 10-12 min. until lightly browned. I’m pretty sure if you placed a bowl full of these nuts in front of me, they’d disappear before you had a chance to blink! I’m putting this on my Superbowl snack recipe list! What a fun twist on roasted nuts. 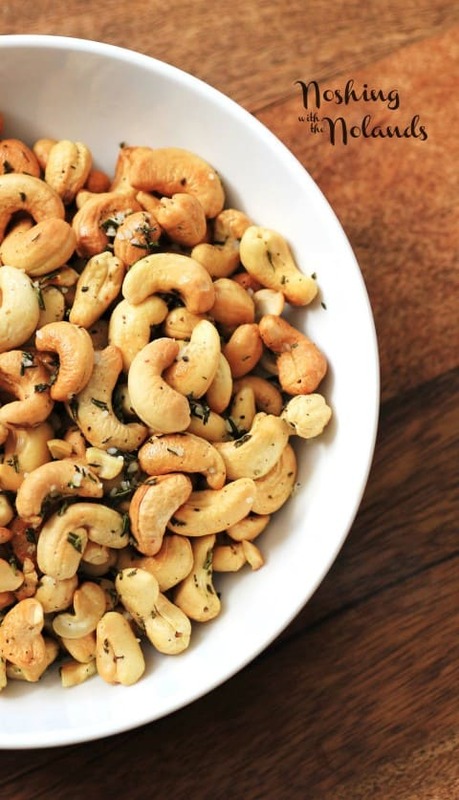 What a great snack – herb roasted cashews are incredible!! Cashews are such a great taste and with these herbs – sublime! Thank you so much Kelli!! Your cashews sound marvelous, Tara! A perfect hostess gift (see, I’d need to get them out of the house and away from me!) or party appetizer. YUM! I was going to give a little jar of these as a gift for a dinner party last night, but hubs ate them before I could get them in a jar!!! Thanks Liz! My favorite snacking nut. What a great way to dress-up your nuts. I need to try this. Thank you so much Janette!! I’m always looking for something new to put out for company to snack on and I have to admit I haven’t seen anything like this before, what a great idea. Thank so much Karen, they are great to start off a dinner party with. I am so sure I will eat an entire bowl of this!! Well they are all gone here, so we did eat the entire bowl. Thanks Zainab!! I love cashews, they are my second favourite nut. Totally going to try this recipe. Just wish I had an herb garden I could use. Next year I want to put in rasied beds. Thank you so much for hosting yet another fun event!!! 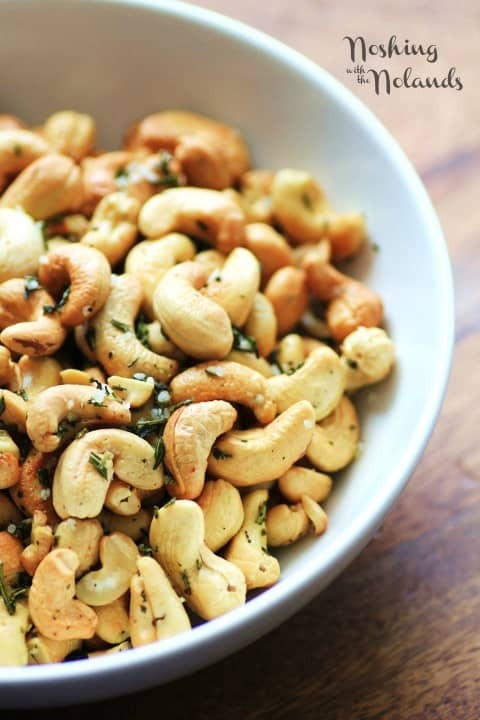 Tara I adore cashews and I love that you used the thyme and rosemary together – wonderful! Thank you so much Patty!! I am a complete cashew nut. 🙂 I would inhale these!! I hear you with the cashews Anita, thanks for coming over!! Thanks Brandi, these would make a great gift for hubs!! This mix looks so alluring! Pass me a handful, please! Love these, and I didn’t know it was grab some nuts day! I’m always picking out the few cashews from nut mixes…this would be a great recipe for holiday parties. It sure would be perfect for the holidays, I will be making it again!! Thanks Sue!! G’day! Cashews are always so addictive to me Tara! I could go for a sample now! i’m always lazy and by my flavoured nuts from the store.. definitely inspired to create my own flavoured nuts at home now, thanks for the idea! They are so easy to make and you can create your own. Your company will be impressed and they don’t have to know that it took you no time at all!! This is my favorite. I love cashew nuts. I have to agree, my fav too!! Thanks Amallia!! I just love this recipe. Cashews are so delicious. And with herbs they are even better. Your photos are outstanding. Just love that first one. Thanks so much for joining us Tara. This event was just what I needed to keep myself distracted. The FB group alone had me in hysterical laughter all month long. Thanks so much for everything you do, we sure appreciate it!! I do believe the cashew is my favorite nut. I’ve thought to gussy them up though. I’d love to give this a try! Oh you must try these David, you will love them!! Thank you!! I don’t have fresh herbs, any suggestions? You can use dried herbs too! !